Being some 6000 miles, several time zones away from home and without your trusty MacBook makes for some challenging conditions in reporting the events of this weekends penultimate round of the British GT Championship. The pole and then the win for Optimum Motorsport’s Flick Haigh and Jonny Adam has placed them firmly into the ‘driving seat’ at the seasons finale at Donington Park next month having turned a points deficit to the #63 Lamborghini into a 17.5 point lead. 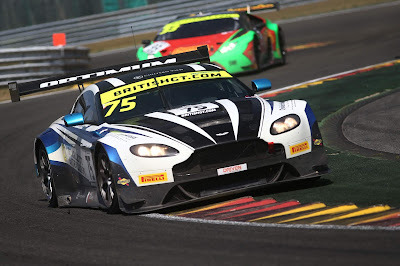 Whilst that is good news for the Aston Martin Racing side of us, we surely have to feel some kind of pity and support onto Barwells Jon Minshaw and Phil Keen as the small piece of track debris that ended their race could have such a monumental effect on the championship. Motor racing is tough, expensive and extremely competitive and we have seen before just how the Donington Decider can effect those not quite fully on it! !